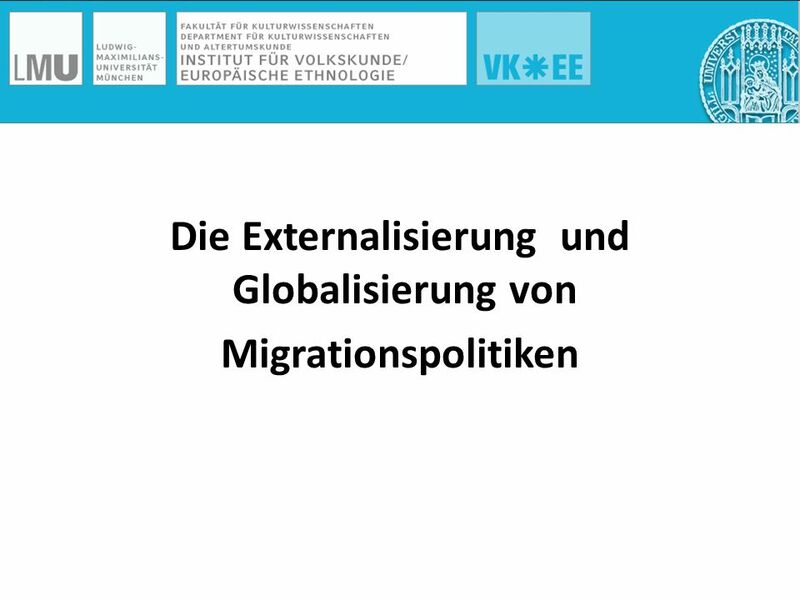 4 Was ist Externalisierung oder Exterritorialisierung? 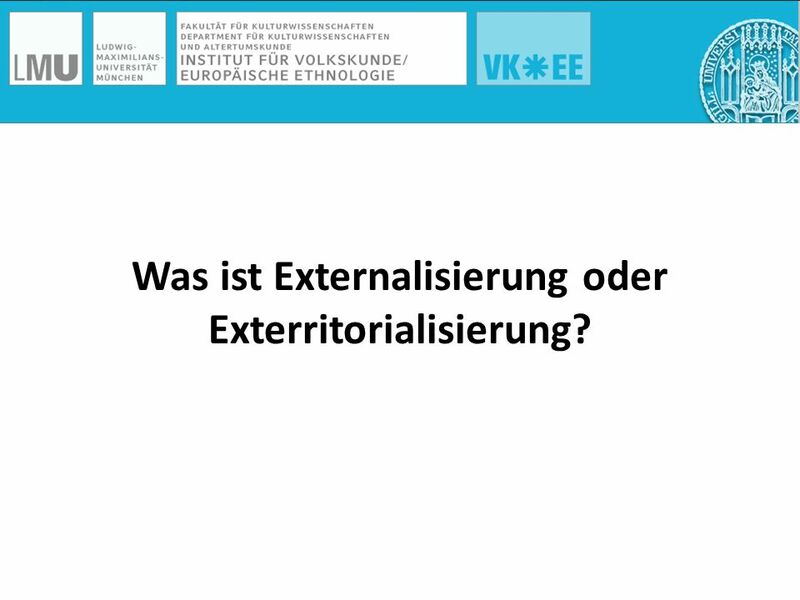 Was ist Externalisierung? 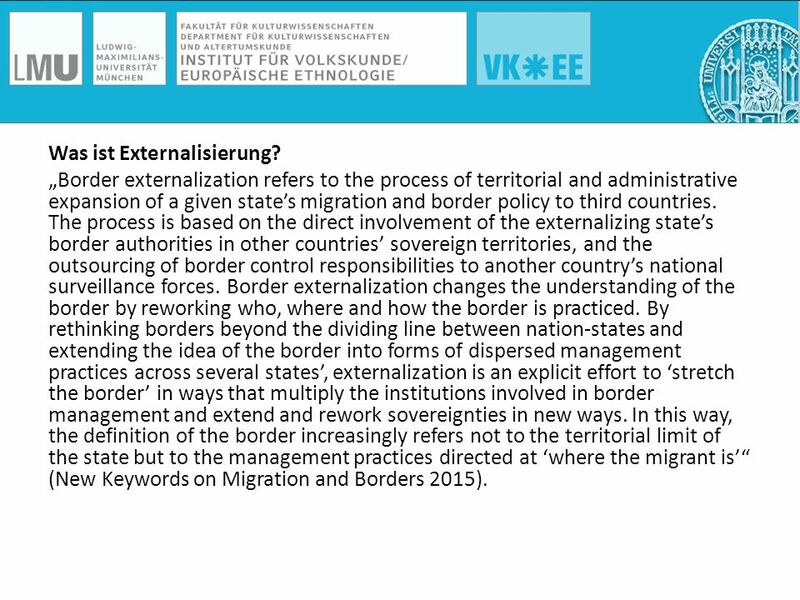 „Border externalization refers to the process of territorial and administrative expansion of a given state’s migration and border policy to third countries. 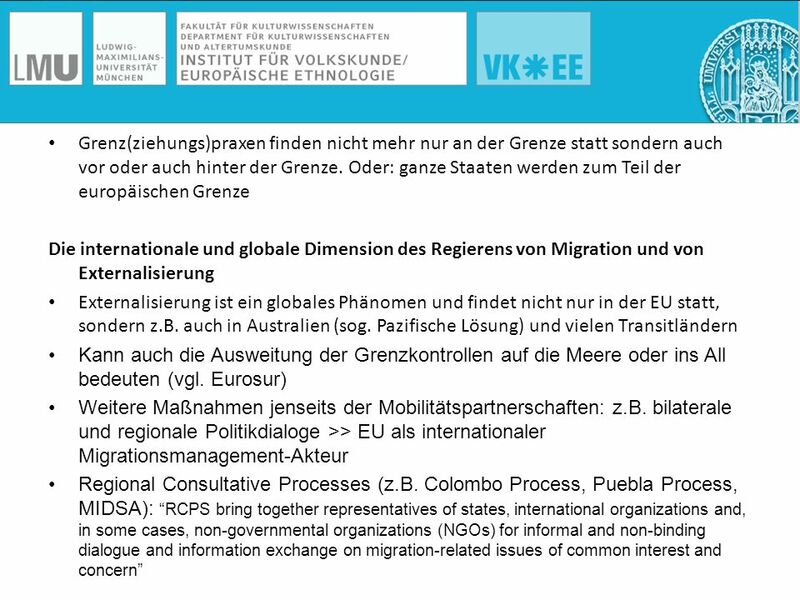 The process is based on the direct involvement of the externalizing state’s border authorities in other countries’ sovereign territories, and the outsourcing of border control responsibilities to another country’s national surveillance forces. 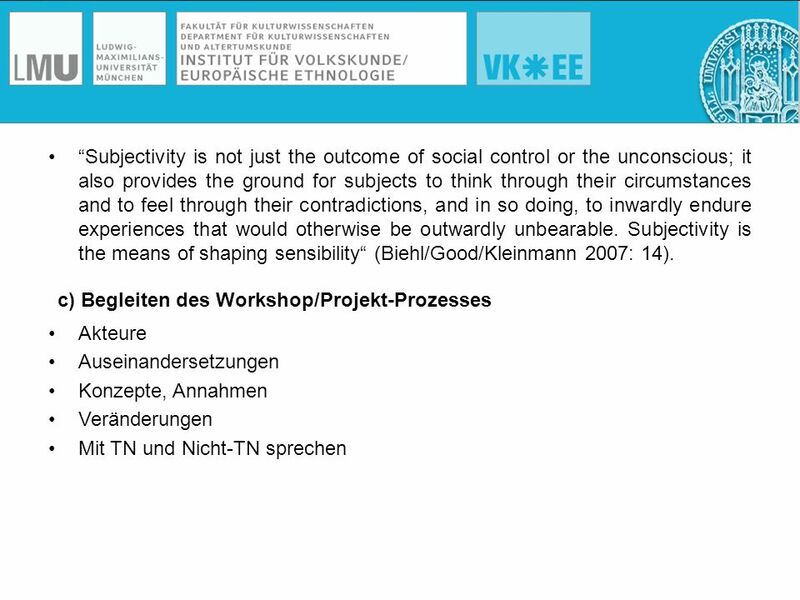 Border externalization changes the understanding of the border by reworking who, where and how the border is practiced. 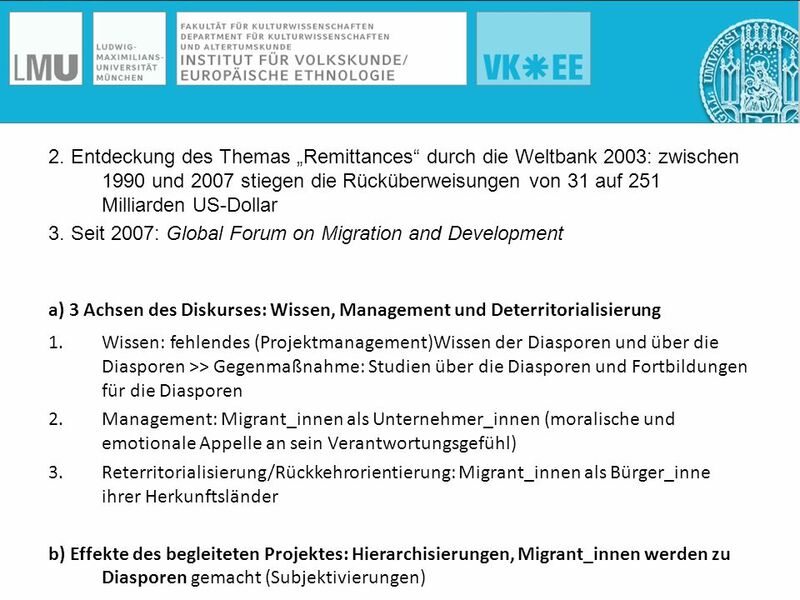 By rethinking borders beyond the dividing line between nation-states and extending the idea of the border into forms of dispersed management practices across several states’, externalization is an explicit effort to ‘stretch the border’ in ways that multiply the institutions involved in border management and extend and rework sovereignties in new ways. 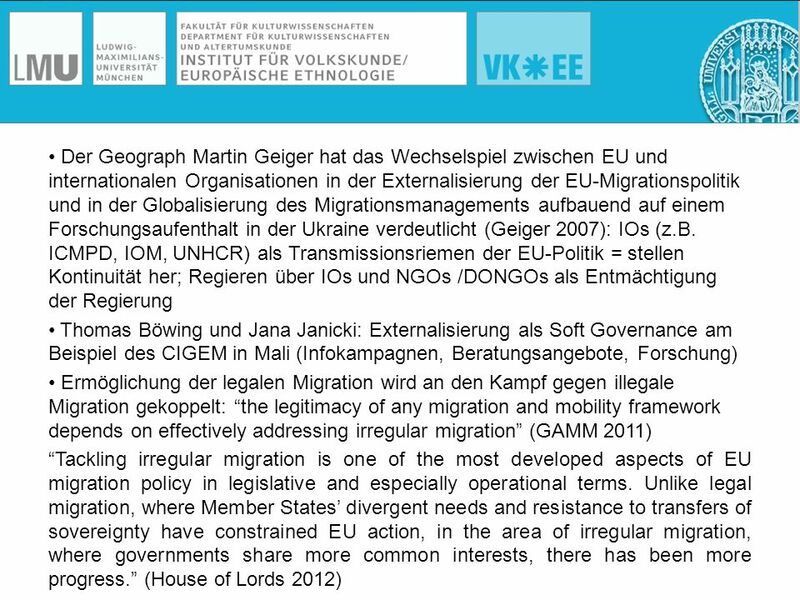 In this way, the definition of the border increasingly refers not to the territorial limit of the state but to the management practices directed at ‘where the migrant is’“ (New Keywords on Migration and Borders 2015). dreifache Perspektive auf den Hype: a. 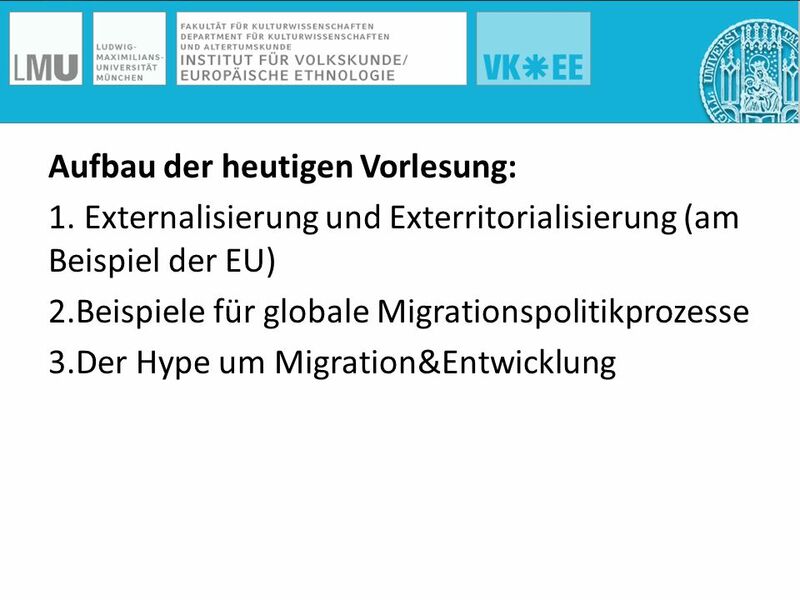 Die Analyse von Diskursen b. Das Begleiten von Subjektivierungs-Prozessen c. Das Begleiten von Projekt-Prozessen Wie kam es zum Hype um Migration&Entwicklung? 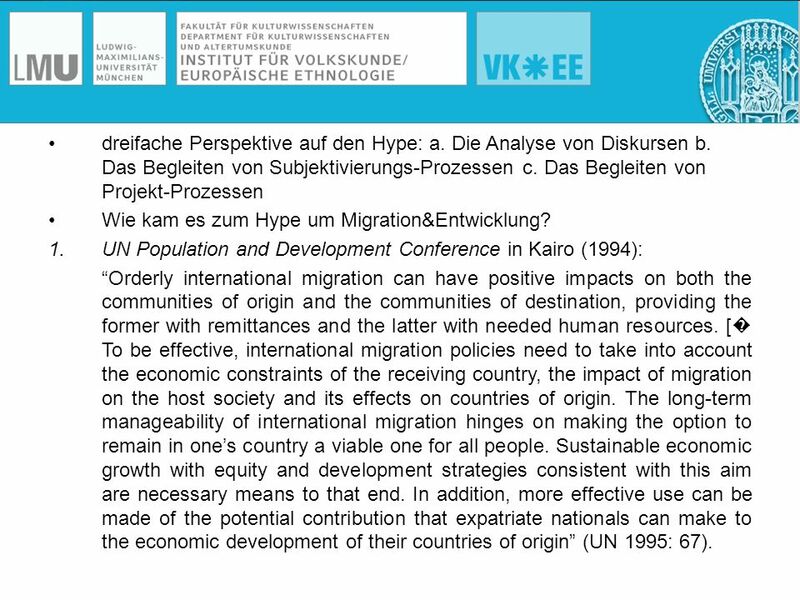 UN Population and Development Conference in Kairo (1994): “Оrderly international migration can have positive impacts on both the communities of origin and the communities of destination, providing the former with remittances and the latter with needed human resources. 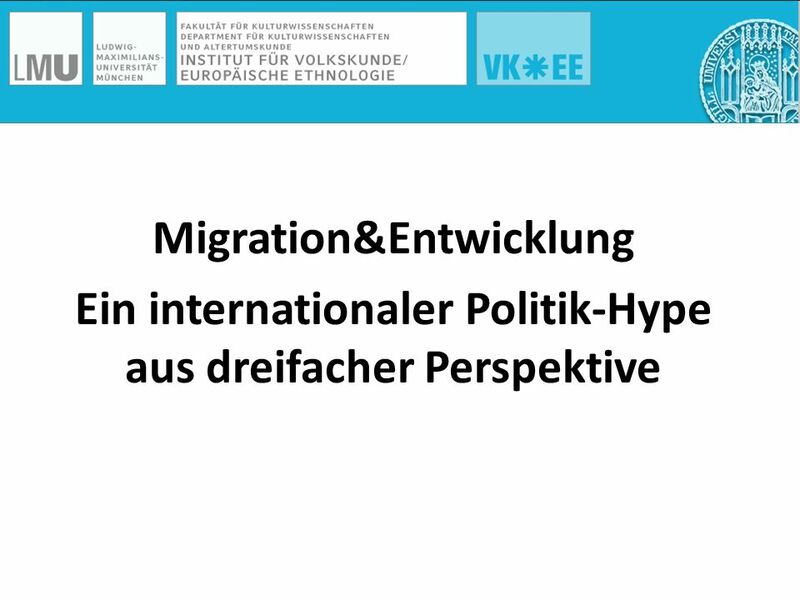 [� To be effective, international migration policies need to take into account the economic constraints of the receiving country, the impact of migration on the host society and its effects on countries of origin. The long-term manageability of international migration hinges on making the option to remain in one’s country a viable one for all people. Sustainable economic growth with equity and development strategies consistent with this aim are necessary means to that end. In addition, more effective use can be made of the potential contribution that expatriate nationals can make to the economic development of their countries of origin” (UN 1995: 67). „Еs ist auch eine Einstellungssache. [..] Wenn man hier ankommt, ist man sowieso von dieser Idee erfüllt, dass man was Gutes, was Tolles zusammen machen muss, auch wenn man in erster Linie sein Studium abschließen möchte. [...] Wenn man hier einmal ist, und jedes Mal, wenn man im Internet schaut, was zurzeit [im Herkunftsland] läuft, unählige Sachen kommen, also andauernd, führt das dazu, dass man sich langsam von der Idee verabschiedet, da überhaupt was für das Land zu unternehmen. Man kann natürlich etwas für seine direkte Familie unternehmen! 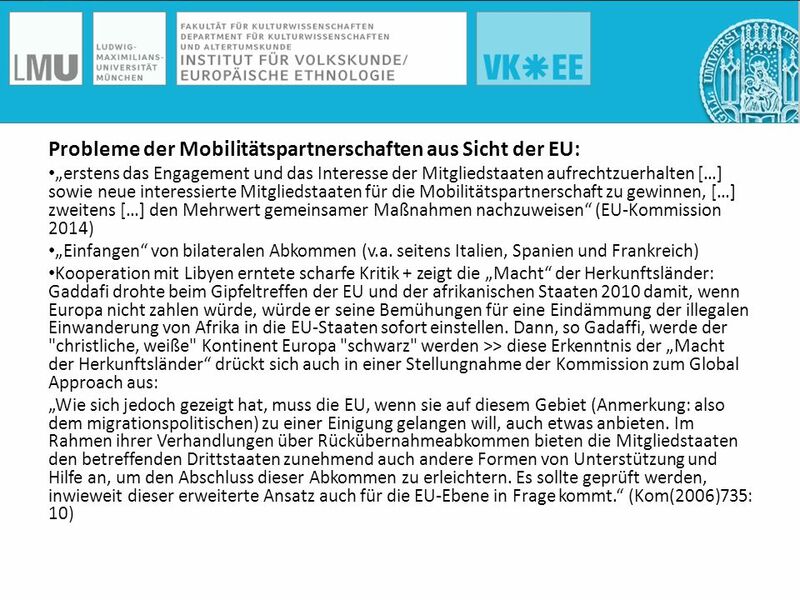 [...] [Denn] sich global zu engagieren, um die Zukunft des Landes zu verbessern: also da verlieren wir hier den Überblick, was man da überhaupt unternehmen kann, wie man sich da engagieren kann. [...] Und vor allem auch die Idee, dass man das umsonst machen muss, dass man auch nicht sofort Früchte der Arbeit erwarten kann, dass man nur seinen Beitrag leistet und so. [...] Da braucht man Geduld! (NG 09/2009). 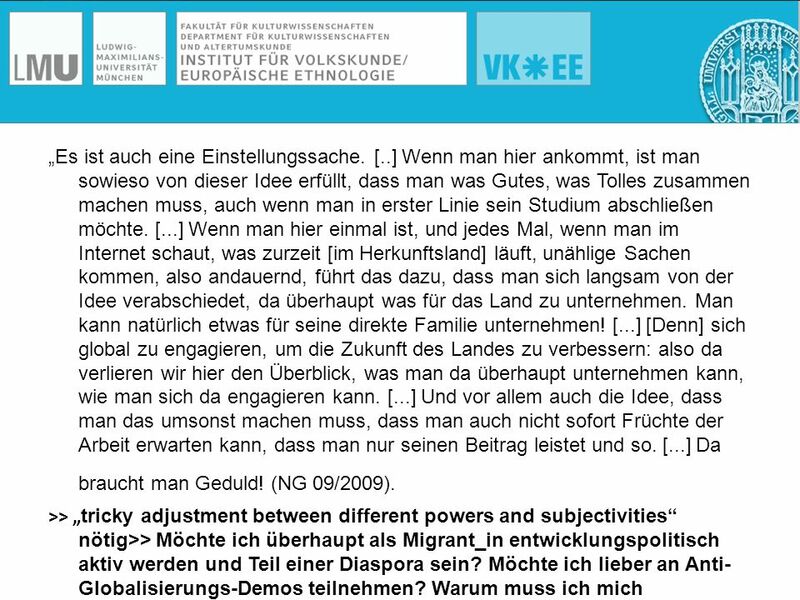 >> „tricky adjustment between different powers and subjectivities“ nötig>> Möchte ich überhaupt als Мigrant_in entwicklungspolitisch aktiv werden und Teil einer Diaspora sein? Möchte ich lieber an Anti-Globalisierungs-Demos teilnehmen? Warum muss ich mich engagieren? 16 Vielen Dank für die Aufmerksamkeit! 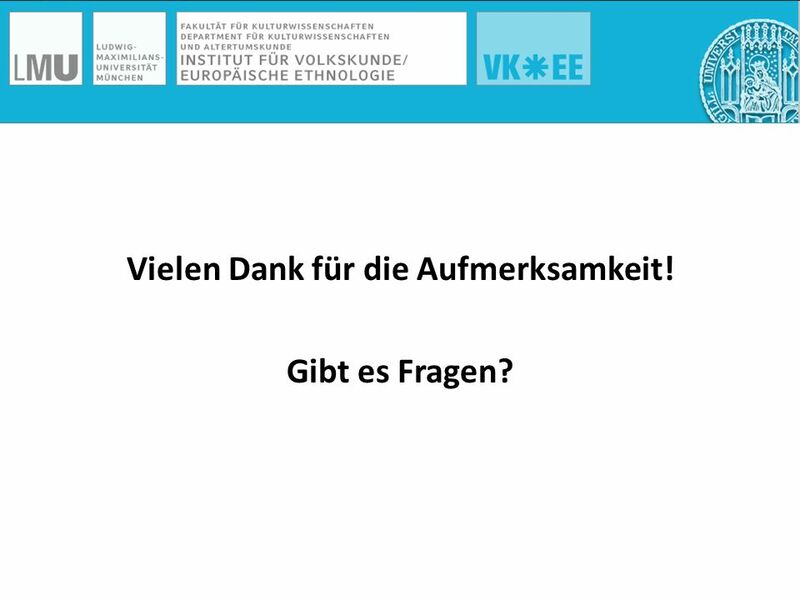 Gibt es Fragen? 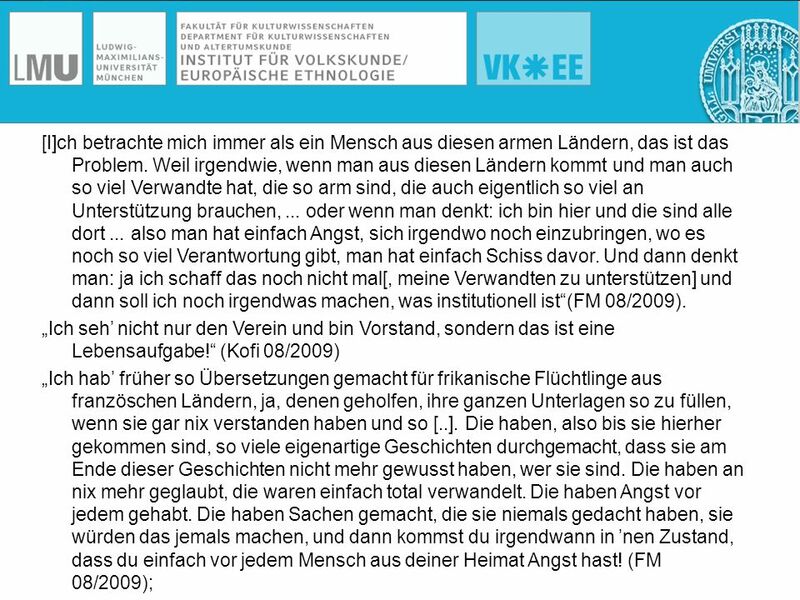 Herunterladen ppt "Einführung in die kulturwissenschaftliche Migrationsforschung"
Comenius Projekt Liceo F.Petrarca Trieste a.s. 2011/12 M. Lamba, V. Munaò, A. Pascazio.